Why is RF/Wireless Continuing Education So Important? Studies reveal that within each 3-5 year period, one-half of an engineer’s technical knowledge becomes obsolete. New graduates soon discover that university education provides only the foundation of knowledge that is realistically needed to perform well in the industry. Continued education is a must for survival in today’s competitive market. Application of modern computer-aided engineering to RF and microwave circuit and system design is vital to manufacturing products with high quality and yield. Modernization of the design laboratory and production floor is critical to maintaining a competetive edge. 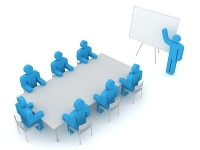 A well-planned continuing education program will enable your company to meet these goals. As a recognized international leader in continuing education, Besser Associates is dedicated to serving the needs of RF and wireless professionals. Our instruction combines theory and practice into one complete and “user-friendly” package that attendees may apply on the job immediately. Whether it’s reviewing basics for the inexperienced, or the latest CAD techniques for more seasoned designers, Besser Associates’ courses offer meaningful education for every participant. Besser Associates instructors are recognized experts in their field. They are top-notch design engineers, skilled in both technology and the art of instructing. With an average of more that 20 years of education and practical first-hand experience, our instructors bring a wealth of training and information to the courses they present. Equally important, our trainers communicate effectively; they know how to reach both novice and veteran professionals. Visit our instructor news page to see the latest blogs, articles, papers and webinars that our team has been up to.